Daimler AG denied a media report that it remains interested in acquiring part or all of Fiat S.p.A.'s industrial unit while separately announcing it would deepen partnership ties with Russia's largest truckmaker, Kamaz. Daimler could buy into the Fiat unit that includes truckmaker Iveco after a planned initial public offering, if a deal isn't reached earlier, German business publication Manager Magazin reported on Friday, citing unidentified company officials. Daimler had previously offered Fiat about 10 billion euros (about $13.3 billion) for the unit that also makes agriculture equipment, while Fiat was seeking between 12 billion and 13 billion euros, the magazine reported. 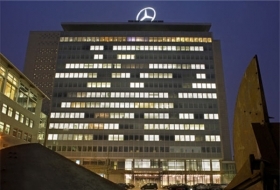 Daimler CEO Dieter Zetsche is also interested in repurchasing former unit Tognum AG, a propulsion systems specialist that is 28 percent-owned by the automaker, Manager Magazin said. Zetsche's predecessor, Juergen Schrempp, sold Tognum to Swedish investor EQT in 2005. Responding to the report, Daimler spokesman Florian Martens said the company isn't in talks with Fiat and it has “no plans” to expand its Tognum stake. Daimler said Friday it would strengthening its partnership with Russia's Kamaz after the two companies agreed to cooperate on axles for commercial vehicles. "The joint venture will supply axles to Kamaz as well as to the joint venture Mercedes-Benz Trucks Vostok," said Stefan Buchner, responsible for procurement and global powertrain operations at Daimler Trucks, in a statement. The two parties plan to invest 50 million euros ($66.55 million) in axle production in Russia. "The strategic partnership between Daimler Trucks and Kamaz has been further strengthened by this MoU and that our joint venture company will also supply axle components to Germany in the future," said Sergei Kogogin, Director General of Kamaz, in the statement. Kamaz will supply individual axle components to the Daimler axle plant in Kassel, Germany, where they will be further assembled. Daimler, which owns an 11 percent stake in Kamaz, is keen on the Russian truck market but has greatly tempered its initial ambitions by keeping its stake in Kamaz far lower than what Moscow would like. When Russian investment bank Troika Dialog looked to further reduce its exposure in Kamaz by selling another 5 percent of its stake to Daimler, the German group went so far as to shift 4 percent of that to the European Bank for Reconstruction and Development. Daimler Trucks chief Andreas Renschler had earlier insisted his company was not in any hurry to expand its then-10 percent stake.